Do you have feedback or a simple question for us? 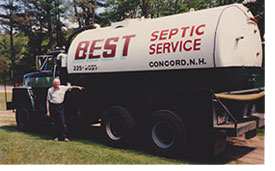 Best Septic Service was started in 1965 by Harold S. Colby in Concord, NH just as this industry was developed. 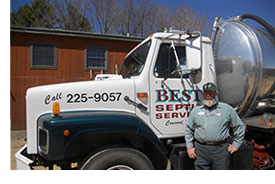 New was the idea of septic maintenance as a preventative measure and Best Septic Service provided pumping and education to all the folks in and around Concord NH. Mr. Colby developed a huge portable toilet service that incorporated most of New Hampshire, including providing portable toilet rentals on top of Mt. Washington when they built the new Observatory/Museum in 1973. In the '80s, Mr. Colby was a charter member of the NH Association of Septage Haulers to which Mr. Colby held several official positions. This association worked with the State of New Hampshire to develop statuary regulations to govern our industry and begin a longstanding educational program for homeowners. Mr. Colby retired in 1990 when he turned the reins over to employee Paul Johnson. Paul and his wife Darlene continued Harold's dream of providing education to homeowners and protecting ground water through proper system operations. Best Septic has grown from one truck and one man to a 5 truck fleet. The next generation steps in with their son Eric who helps keeps Best Septic local and a small family run business committed to its' customers. Since the beginning, Paul and Darlene have been active community supporters of local youth programs, as well as drug awareness programs in their home town and many of the towns in their service area. Both Paul and Darlene have gone beyond just working in their own office, working on or with industry related associations such as the NH Association of Septage Haulers, National Association of Wastewater Transporters, and Granite State Designers and Installers. Staying connected and educated about what the industry is doing. Darlene participates in several state and legislative appointed study committees where she has lent support and knowledge of the industry to legislators and state officials. © 2017 Best Septic Service - All Rights Reserved.